Crohn's is often an allergic response to food allergy or intolerance and possibly the food poisoning may have set the stage. Doctors continue to emphatically rebut the possibility of such a connection, but there's plenty of evidence that suggests it should be one of the very first places to start looking. Having said that I highly recommend that you get the book "Life Without Bread by M.D. Wolfgang Lutz". To get you started as quickly as possible I have extracted the relevant data to convince you to immediately get off all carbohydrates (fresh vegetables with very few root ones are OK) and all processed foods. "The most easily measured parameters used to monitor the course of Crohn's disease are blood iron levels. Typically, these levels are below normal in Crohn's patients." Intolerance and in general improperly prepared carbohydrates are notorious to cause mineral deficiencies and does not apply only to iron but all minerals! Further due to poor digestion most vitamins are also depleted. Also if you have cut back on saturated fats, as most do, then you will develop even more mineral deficiencies as this is the critical fat for absorbing minerals. Do take some organic butter (preferably raw) and eggs (unless your allergic to them) in your diet and stop all processed foods (this includes all vegetable oils (unrefined olive for salads, coconut and palm for cooking are the only exceptions) and most milk products, unless raw, these are all adulterated)! Start taking a table spoon or two of Cod liver oil* is especially rich in omega-3 and Vitamin D. Both are deficient in Crohn's patients. *Fish-oil capsules, and especially omega-3, proved helpful to Crohn's sufferers in one study (N Engl J Med, 1996; 334: 1557�60). Supplementing with folic acid can also help (Scand J Gastroenterol, 1979; 14: 1019�24), as can vitamin E (Am J Clin Nutr, 1976; 29: 1333�8). It's important to support your gut's mucosa (inner lining) with the B, C, A and D vitamins. If the condition is chronic, vitamin K may also be useful (Am J Clin Nutr, 1985; 41: 639�43). Probiotics can help boost the gut's 'friendly' bacteria. Herbs: If you believe that bacteria could be the cause, try goldenseal, which is rich in berberine, a natural antibiotic (Nature, 1967; 215: 527�8). Another herbal, is slippery elm, available in tablet form. **Mind�body: There's evidence that our emotions, especially stress, can affect Crohn's. It's not surprising to learn that psychotherapists have had great success with the condition, even though it's never been reported in the medical literature. Hypnotherapy has also proved to be effective in relieving symptoms, and biofeedback has had similarly impressive results (Ann Intern Med, 1985; 103: 291�3). One of the easiest ways is through breathing. Every day try at least to breath out deeply till you feel tingling in your toes, then breath in naturally. Do this at least 36 times during the day or preferably together once a day. Don't worry if you loose count just start over. Start to take as much vitamin C*** as you can. To better assimilate mix some powder or crystals, say 1/4 teaspoon (1gram), in some water and drink several time during the day hourly if possible. Use a straw as Vitamin C is corrosive to the teeth. If the Vitamin C starts to give the runs reduce but don't stop. Do not mix Vitamin C before hand but make it fresh as over time it will lose its potency. The primary idea is to maintain the vitamin C all times in the body; as any type of stress will cause a huge uptake in Vitamin C.
"A case of scurvy presenting in a patient with Crohn's disease is reported. A normal response to replacement therapy is seen. Vitamin C (ascorbic acid) deficiency was found in 7 out of 10 patients with clinically quiescent Crohn's disease, 4 of whom had an adequate oral intake of vitamin C. There was no significant difference in oral intake between patients with Crohn's disease and matched controls but there was a significant difference (P less than 0.001) in leucocyte ascorbic acid levels. It is recommended that patients with Crohn's disease be screened for vitamin C deficiency and receive prophylactic vitamin C supplements daily." Vitamin E is generally depleted in Crohn's disease supplementing up to 1200 mg (Mixed Tocopherols) will help restore and enhance antioxidant levels. Finally you can also follow the immune building methods suggested in "Ideas For Cancer Self-treatment"
Here's to a fast recovery and do keep me posted on your progress. Crohn's disease is a severe form of enterocolitis. It was named after the American physician Burril Crohn, who was the first to show that the tumorlike swelling in Crohn's disease was inflammatory and not cancerous. In Crohn's disease, the illness is not limited to the mucosa alone, as in enterocolitis, but instead involves all levels of the bowel, the mesentery, the lymph nodes, the gallbladder, the duodenum, and the stomach. The main site of Crohn's disease is the last part of the small bowel, but it can extend into the colon. Crohn's disease has become much more common in recent years. In the last ten years, more than 600 cases have been observed and treated in Dr. Lutz's practice. The distinction between Crohn's disease and ulcerative colitis is ignificant. Crohn's disease, in contrast to ulcerative colitis, heals with great probability from a low-carbohydrate diet within six months to one year, and usually without complications. Those afflicted with these very similar colon disorders would be advised to be sure their doctors have made the correct diagnosis because Crohn's disease is readily treated with carbohydrate restriction, whereas ulcerative colitis takes more time and there are relapses even if the patient adheres strictly to the 6 BU (bread unit) diet. In ulcerative colitis, there is always some bleeding. The involvement of the colon observed using endoscopy decreases from the end to the beginning of the colon. In Crohn's disease, the most-often-involved part is the end of the intestine, and from there the beginning of the colon. In ulcerative colitis, the process is always limited to the mucosa, whereas in Crohn's, the muscular layers and the lymph vessels are involved. This can lead to fistulas and other complications, which necessitate surgery. Crohn's disease is still regarded as incurable by Western medicine. This is because the simple concept of reducing carbohydrates in the diet is not included in the treatment arsenal of modern medicine. There was some discussion in the scientific literature years ago about the benefit of reducing refined sugar and flour for the treatment of Crohn's disease. Dr. Lutz was the only one to follow this up. However, he went even farther and prescribed a treatment regimen of a reduction of total carbohydrates, not just refined, processed carbohydrates. While a low-carbohydrate diet does not provide a cure rate of 100 percent there is a high rate of return to normalcy without a relapse, which is as close to a cure as one can get today. We hope that the results we are about to show will change the current treatment of Crohn's disease. It is certainly a shame that so many suffer when a simple treatment is available, and one that bears no great medication cost. The results obtained from sixty-seven patients with Crohn's disease who were treated with carbohydrate restriction are shown in Figure 7.1. Patients were followed for up to three years to determine the long-term effects of carbohydrate restriction on their disease. More than 80 percent of the patients were symptom-free after eighteen months on the diet, and 70 percent were symptom-free after six months on the diet. We have included in this figure a line representing the failures� those who did not respond to the diet. Unfortunately, the low-carbohydrate diet does not cure everyone afflicted with Crohn's disease, but it still offers the best clinical outcome that we have ever observed for these people. We know that some people stop the low-carbohydrate program after a few months because they see no improvement, or their doctor disapproves of the diet. Sometimes the complications are too severe and prevent a rapid amelioration. In any event, the failures might simply be due to stopping the diet. 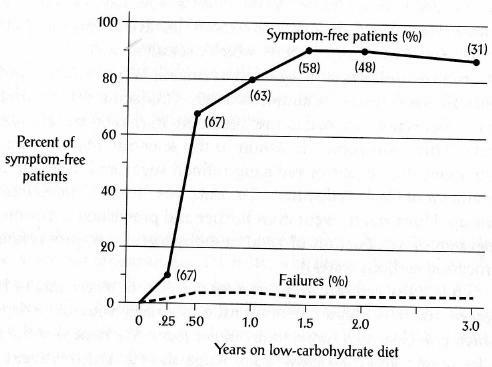 Figure 7.1 The time course of Crohn's disease in sixty-seven patients (initially) who followed a low-carbohydrate diet. After one-and-a-half years, over 80 percent were symptom-free. The numbers in parentheses are the total number of patients evaluated at the given time. The most easily measured parameters used to monitor the course of Crohn's disease are blood iron levels. Typically, these levels are below normal in Crohn's patients. A return to normal levels is a good marker that the problem has disappeared, in addition to how the patients feel and how their physical symptoms regress. 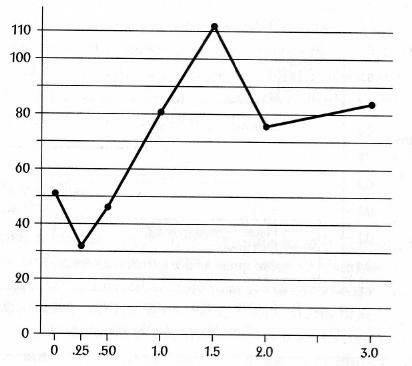 Figure 7.2 shows what happens to the iron count in the blood serum over the course of three years in Crohn's patients who adopted a low-carbohydrate diet. There is an initial decrease in already below-normal levels after about three months, but the levels steadily rise and normalize after eight months on the diet. This also corresponds to the changes in physical symptoms that these patients experienced, shown in Figure 7.1. Figure 7.2 The changes in iron levels improve in patients with Crohn's disease when a low-carbohydrate (72 g/24 hour) diet is adopted. In a more controlled study of Crohn's disease, a reduction of carbohydrates also resulted in significant improvement compared to patients who did not use the diet. A prospective, randomized study of the effects of a reduction of carbohydrates was done with the cooperation of the German Morbus Crohn and Ulcerative Colitis Association. Two groups of fifty voluntary patients were chosen who were undergoing inpatient treatment of large doses of cortisone at the beginning of the study. Cortisone is a steroid that can reduce autoimmune reactions and inflammation, and is used as a treatment for many types of autoimmune disorders. Long-term use of steroids is damaging to the body, and alternate therapy is always desirable. The study design was such that, in both the control group�those who did not eat a low-carbohydrate diet�and the intervention group�those who were supposed to adopt a low-carbohydrate diet of 72 grams or less in twenty-four hours�the cortisone medication was stopped. Participants were monitored and evaluated to determine the rate of relapse of their Crohn's symptoms. In reality, most of the low-carbohydrate group did not stick with the 72 grams per day. They consumed up to 12 BUs per day, or 150 grams of carbohydrate. The results of this study are presented in Figure 7.3 (not shown here). Even though the intake of carbohydrates was greater than what Dr. Lutz had required of his patients, the results were impressive. After 90 days, the patients on the diet had already started to see differences, compared to the control group. Relapses were clearly less frequent in the diet group; after 200 days, the diet group experienced no more relapses at all. The end result was that patients who were treated with a reduction of carbohydrates had their symptoms essentially disappear. Once again we see that the influence of a reduction of carbohydrates plays a key role in a health benefit. Fat is not the culprit here nor is fat the culprit in most other age-related degenerative disea The time has certainly come to return to the diet that mankind evolved to eat, and to set the human race on a steady course to eliminating many of today's "incurable" diseases. WHY DOES LOW-CARBOHYDRATE NUTRITION WORK? We do not know exactly why low-carbohydrate nutrition has such an impressive effect in the treatment of Crohn's disease and colitis. But we can speculate based on the basic premise of why carbohydrate restriction helps in many diseases. Our idea here is that carbohydrates induce the pancreas, specifically the islet cells, into overstimulation, that is, excess insulin production. This is a known fact. This overstimulation may radiate to the other islet cells, which causes the entera to accelerate the movement of ingested food, so that the intestine cannot digest them properly. This partially undigested food enters the terminal ileum, which is not able to absorb the foodstuffs. Eventually, the undigested food enters the colon where the bacteria there digest it, which causes chronic irritation, involvement of the immune system, and colitis. This is the same way that hyperacidity is caused by too much carbohydrate in the diet. Gastrin, the hormone that gives rise to acid production in the stomach, is a close relative to the insulin-producing islet cells. Overstimulation of the islet cells for insulin production may result in overstimulation of other similar cells. Medications cannot be discontinued immediately since it takes some time for the diet to take effect. First, the patient should be weaned from cortisone since these artificial adrenal cortex preparations generally inhibit protein synthesis. This means they not only suppress the production of immune cells and thereby subdue the symptoms, but they also interfere with the healing of the mucosa. Eventually the patient will be able to discontinue all medications. Should there be a relapse in the first few years, one can temporarily take up the medication again. A mild relapse does not require medication. Dr. Lutz has a large file full of thank-you letters from patients who had tried every possible therapy unsuccessfully and finally were left with surgery as the only option, before they came to him. There are more than fifty thousand cases of Crohn's disease and ulcerative colitis in the German-speaking countries alone, and surely at least that many in the United States. We ask, "Why aren't these sufferers put on a low-carbohydrate diet? Why doesn't this simple treatment become established?" Perhaps it is because the results we have just presented are not known. We fear, however, that there is no limit to the disdain of those who practice orthodox medicine for all alternative, "outsider" treatment methods�acupuncture, neural therapy, chiropractic, homeopathy, to name but a few. We agree that caution is partially justified, but no one used their orthodox medicine to prove the alternatives wrong! We find that this is where many problems arise with today's "medicine." Techniques that show promise, or methods such as low-carbohydrate nutrition that have been proven, are generally ignored�not disproved, just ignored. A well-known and respected researcher simply has to say that a method does not work, and bingo! Without any proof, an unsubstantiated statement then becomes the dogma of the day. But this situation is changing. To ignore scientific information, is, in our opinion, irresponsible. There is, however, a viable alternative: Eat what you can tolerate. Although colon and gastrointestinal disorders are not often considered when people talk about diseases, both represent significant problems for a great many people. We have shown you that serious diseases of the digestive tract show great improvement when a low-carbohydrate diet is the chosen food regimen. As we indicate throughout this book, low-carbohydrate nutrition actually can correct many poor-health conditions; therefore, it must be the correct diet adapted by human physiology. Nowhere in the scientific literature has a comprehensive set of data been formulated to indicate that a low-fat diet can resolve so many conditions. We absolutely believe that most of the diseases we discuss would never even begin if people maintained a low-carbohydrate diet throughout their lifetime. It is time to move past the special interests that guide today's low-fat food craze and face the facts. Whether it's the carbohydrate producers or the people who can't or won't admit that their theory has failed, it is time to think of the greater good for humankind. Those who state that low-carbohydrate diets are a "fad" are either in denial, ignoring the facts, or aren't thinking clearly about it. Carbohydrates, particularly in large amounts, are the most recent, as well as the most harmful, addition to the human diet. All you have to do is follow the program outlined in this book, and after a few months you, too, will know the truth. And when you feel that good, no one will be able to convince you that you're doing something detrimental to your health. I am writing to you on the recommendation of Robin Good, who I recently started working for as executive editor. The last thing we did together was a video mash up and write up about the Pirate Bay and I work a lot on the video production side of things. The reason that Robin said I should get in contact is that I am a Crohn's "sufferer", and am in the middle of a particularly nasty flare up at the moment. He said that I should ask if you would be willing to give me a little advice on what best to do. I am getting a flight back home on Friday (I live in Tokyo at the moment, going back to the UK) to seek medical assistance. In addition to the usual watery/pus scented bowel movements, and a couple of minor incidents with fresh, red blood, and stomach cramps/intestinal pain my legs have been very badly effected so that it is very difficult to walk. My knees are swollen and difficult to bend, and my ankles and feet have swollen up too - especially on the right side, where there may also be a hard lump, but I am not sure if this is another swelling or even a bone. The skin is reddened around it, and my foot has a lot of bruises and red marks both top and bottom (happy to send a picture). The soles of my feet are very tender and painful to walk on. In short my muscles and bones seem are in a lot of pain, and I am occasionally woken up with painful cramps in my legs. Most recently, the elbow joint in my right arm is also a little painful to move, and there is a feeling of tightness in the ligaments behind my knees when I walk. I wondered if you might have any ideas as to how I could help myself out in this situation? I want to get the lump looked at, but I don't want to go back on steroids or Aziothioprine, which is what I was put on after my first flare of Crohn's about four years ago. The steroids made my face and body swell up and my mood highly changeable, and the list of side effects of Aziothioprine is frightening in its depth and power. I was also on Asacol, which seemed to be okay, but what a cocktail! The time up to my diagnosis with Crohn's I was suffering from a similar condition to now, unable to walk, and this time I had erethema nodusum on my shins, too. It seemed (perhaps a coincidence) to be spurred into action by an incident of food poisoning in Paris, but I can't be sure about that. My Crohn's has been totally fine for about three years, and when I came to Japan two years ago I made the decision to ween myself off these medications as they were really wearing me down and making me ache all over. After a couple of months of reducing the quantity steadily, I was drug free and have been fine until now. The only recent change in my circumstances has been a cross over of two jobs - having to continue at my old job while starting a new one has meant long working days of about 15 and 16 hours, which I am not used to, so I guess a lack of rest and stress may have played their part, but I'm no expert. I hope that this gives you an indication as to the background and state of things. I appreciate that you might be too busy to help, but thanks for your consideration anyway! If you decide that you can give advice on this case, please feel free to edit and publish it as you see fit, including all or part of this email.